"I use the team at CRM to challenge my thoughts on pricing and where the market might go help my clients achieve a better price, it also provides the owners of the farms we manage with the confidence that their grain is being marketed independently and professionally"
"We work closely with CRM Agri to execute a bespoke plan increasing physical sales and often protecting our downside. Highly recommend CRM Agri!" "Historically we had 2000T in pools, however, after two years with CRM Agri we now market all our grain independently and our results at the very least match and usually beat the pools"
"It's not just about yield but getting the best price for what we produce, particularly in tough times. The independent advice from CRM Agri gives us the insight we need to understand the markets and increase our profitability"
"Farmers don’t have time to analyse what’s happening all over the world, which makes the strategy CRM Agri gives us invaluable. We concentrate on growing the crop and rely on CRM to provide us with the strategy to get the best price we possibly can"
EU wheat has remained rangebound this week amid a lack of fresh news and despite sluggish exports which stand about 26% down on last year at 9.4MMT, according to the European Commission. 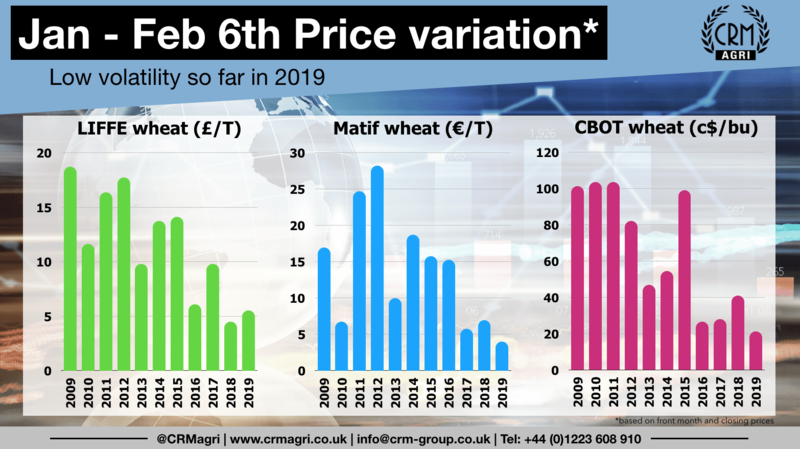 With operators staying on the sidelines ahead of important updates coming from the USDA on Friday, Matif wheat has been trading within a very narrow 4€/T range [based on closing prices] since the beginning of the year, the least volatile market over that period in more than 10 years. The record high flour price observed in Russia is set to translate into a slowdown in the country’s wheat exports for the remainder of the season after a record 27MMT of wheat had already been exported as of the end of January or 3/4 of the ‘official’ 36MMT target. Regarding maize, prices remained under pressure for a second straight week over improving conditions in South America and record EU imports of 14.6MMT (+45% year on year). However, the pace of maize imports could slow over the next few months, particularly from Ukraine which accounts for more than 55% of the total or 8.1MMT vs 35% last year or 3.5MMT. 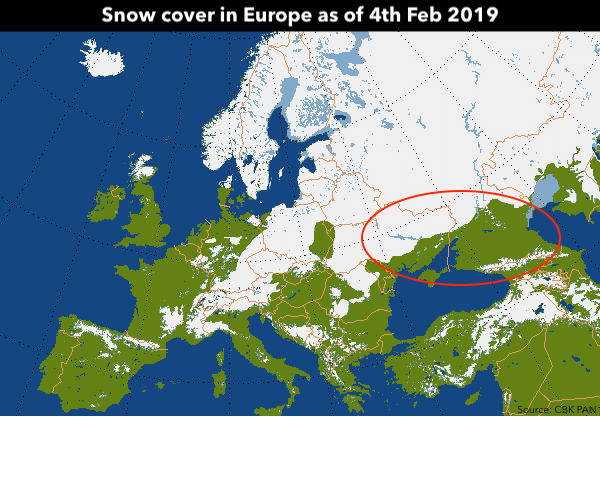 Looking ahead, yield potential of winter crops for the 2019 harvest has generally improved since plantings although the winter is far from over and snow protection is disappearing rapidly across the Black Sea.